Glam Morena: Punk Couture Giveaway! I am completely in love with the MAC Punk Couture Collection right now! 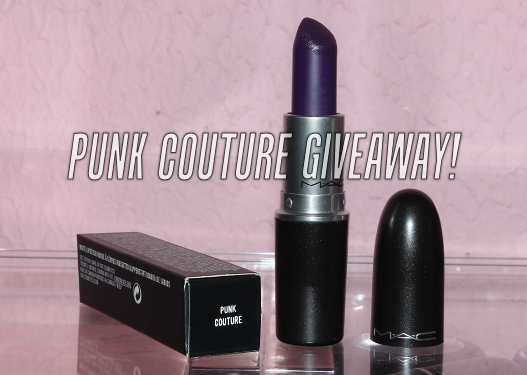 I decided do a giveaway featuring one of the most sought after lipsticks from this collection: Punk Couture. MAC describes this lipstick as a deep blackend grape with a matte finish. You must be a subscriber of my Youtube Channel to enter this giveaway. 1) Must be a subscriber to my Youtube Channel. 2) Must leave a comment on this Youtube video. i like viva glam by mac! My favorite winter color is Jordana lip stain in Cranberry Crush. I don't have a favorite.. I haven't been much of a lipstick/gloss wearer.. but I want to start! I love that shade of lipstick!! I love MAC's Pink Pearl! my fave winter lipstick right now is milani's "black cherry"!